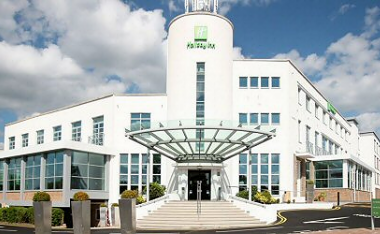 February, and the third 4NCL weekend: a new venue beckoned, the Holiday Inn, near Birmingham Airport, roughly equidistant to the former Hinckley Island location for those travelling from north and south, but, on the day, practically inaccessible for the latter. Triskaidekaphobes might suspect the influence of the previous day, Friday the 13th, which was a particularly foggy one for those travelling to the venue overnight. Anyway, the fog continued into the morning of Saturday the 14th, and was the cause of two major road accidents on motorways headed north, leading to the closure of the northbound M40 and M1 at key points. Yours truly learnt of this via the car radio about ten minutes into my own journey and decided that, with two such important open files duly blocked, the hour's contingency I had built into my journey plan would be wholly insufficient. The best strategy would be to stay on the back rank (or rather, in my back bedroom) and follow play from afar. Wood Green, once again labouring under the handicap of being a player short, nevertheless won rather comfortably, with their top boards performing well. Neil McDonald was one casualty, coming unstuck against Darren Wheeler's French Defence, and Sarah Hegarty another, with a Giuoco which was a bit too Pianissimo for comfort against Jonathan Swindells. Malcolm Pein played a sprightly Benoni. 17...Ne4! 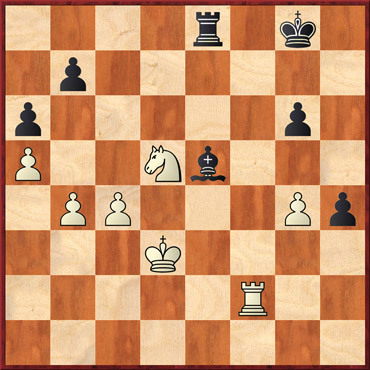 This wins the c3–pawn, though White can maybe hope to get a tiny bit of play for it. 18.Rxe8+ Qxe8 19.Bd2? 19.Bf4! Nxc3 20.Qe1! is tricky, e.g. 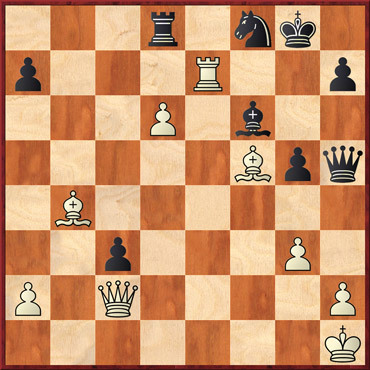 20...Ne2+ 21.Kf1 Bd7 22.Bxb8 Bb5 23.Bc7 Nc1+ 24.Kg1 Qxe1+ 25.Nxe1 Bxa1 26.d6 and, rather unjustly, White seems to be escaping the consequences of his previous sins. I wouldn't fancy having to calculate all that at the board, however. 19...Nxc3 20.Bxc3 Bxc3 21.Ra3 Bf6 22.Nd2 Bd7 23.Ne4 Bd4 24.Qf3? White's last outside chance was 24.Qxd4!? cxd4 25.Nf6+ Kf8 26.Nxe8 Rxe8 27.Rd3 when he's a pawn down but not completely dead. 24...f5 25.Nd6 Qe1+ 26.Bf1 b5! 27.Ra2 Black's last move cuts off the knight's only safe retreat, but if 27.axb6 Rxb6 28.Nc4 Rb1 he's being mullered on the back rank. 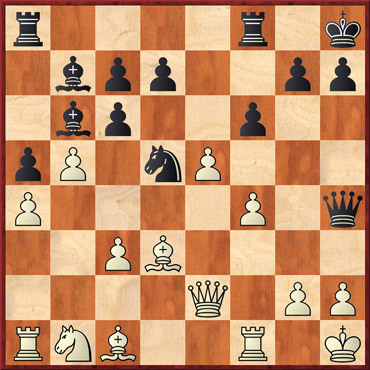 27...Qe5 28.Qf4 Qxf4 29.gxf4 c4 0‑1 Getting ready to perform the last rites on the knight with Bc5. Blackthorne Russia beat White Rose by the odd point, which was a major set-back for the Yorkshire side, who had led the pool at the end of the second weekend. 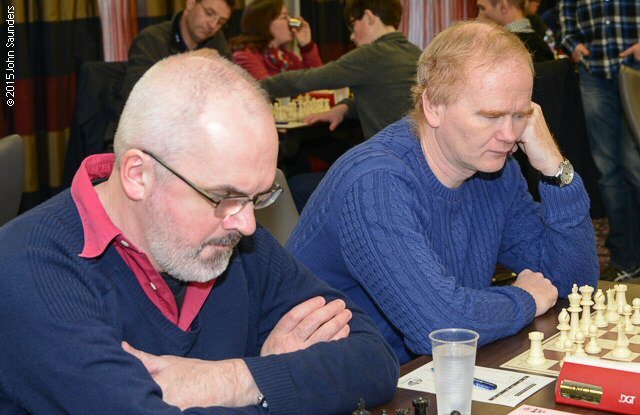 This match featured some very good-looking chess on boards one and two, where Adam Hunt beat Peter Wells, and James Adair beat Danny Gormally, and a couple of rollicking tactical encounters in which Richard Bates beat Ian Gourlay and Laurence Webb overcame Colin McNab. I recommend playing through all four of these games but I shall only feature one here. The chess analysis engine makes fools of us all so I hope the two gentlemen who played this game will forgive me for pointing out their human failings. 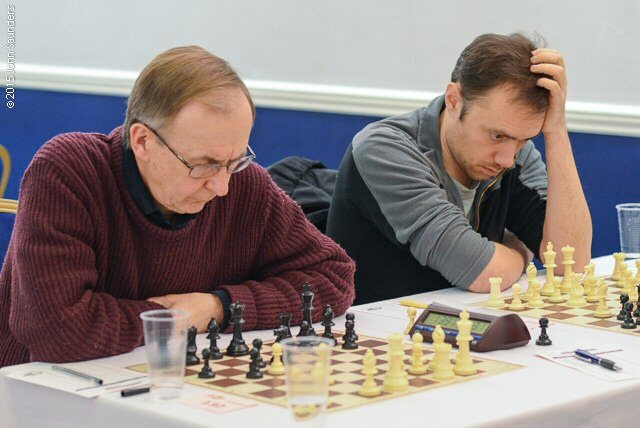 Guildford 2 won comfortably enough against South Wales Dragons but the only game of interest was the one which their top board Nick Pert lost to James Cobb. A Nick Pert loss with White is a very unusual occurrence, as acknowledged by Guildford supremo Roger Emerson after the match. 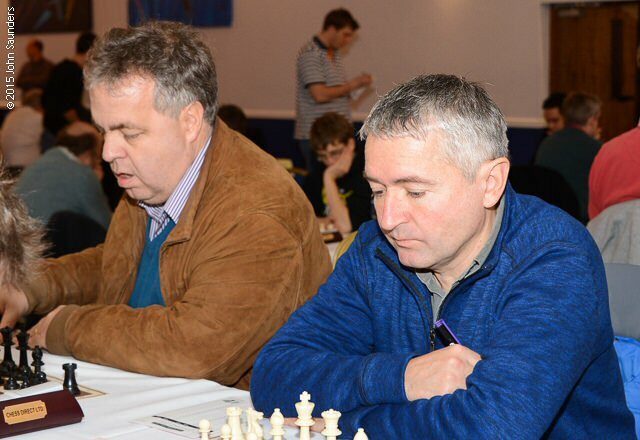 Actually, board two was also quite interesting, with John Cooper having a markedly superior position when Aussie GM David Smerdon offered him a draw. No doubt John was in time trouble, however, so a half point in the hand might have been better than a full one in the Australian bush. Let's look at James Cobb's win. Cambridge University received a fearful tonking from a full strength Guildford 1 team, but the Light Blues could count themselves just a tad unfortunate. For one thing, one of their number was absent, presumably in a traffic jam, leaving Matthew Sadler with nothing to do but watch his absent opponent's time tick away. For another, even their loyal manager/sponsor Roger Emerson admitted that the final score was “incredibly flattering”. The Guildford's various opening sequences didn't look all that convincing, apart from Romain Edouard, who indulged in a theoretical duel with Ravi Haria. 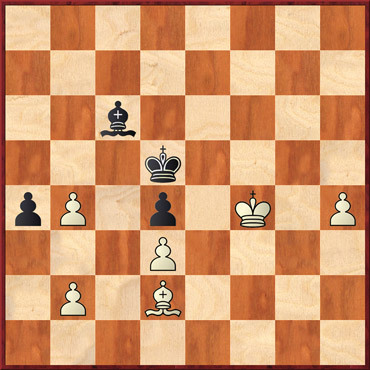 Romain does this sort of thing regularly: only a few days ago in Gibraltar I saw him play a surreal line in the Queen's Gambit where Black holds onto the gambit pawn like grim death and then gives up the exchange very early. That game brought him the Tradewise Gibraltar best game prize, and incidentally the same line was used by tournament winner Hikaru Nakamura to win an early game in the same event. Here Romain is on the White side of a QGD and breathing fresh life into the Ragozin line. John-Paul Wallace's opening didn't look too bad but then his minor pieces got into a tangle and that was pretty much all Gawain Jones needed to take over the initiative and barge him off the board. Reminded me a bit of a rugby match. That may not be a coincidence as I think Gawain did used to play rugby, and only a month or two back he partnered former England rugby manager Sir Clive Woodward in a pro-am chess event at the London Classic. And his wife Sue is a Kiwi and a rugby player herself. Just checking my facts on this, I headed over to Gawain's blog (gawainjones.co.uk) and discovered that the last post there was entitled ‘Rugby Mania'. My case rests... well, it will do as soon as I can think of a suitable pun to go with it (as Gawain really likes my puns. Or really hates them. Can't remember which but it was definitely one or the other.) White starts well enough, but it's not long before All Black's pieces push him off the board (good enough? Please yourselves). 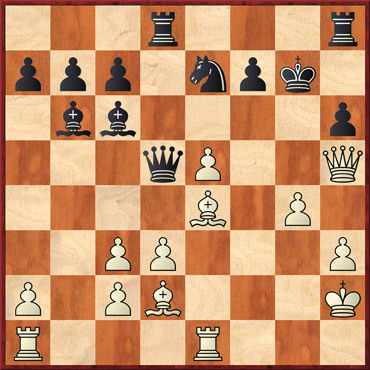 1.d4 Nf6 2.c4 e6 3.Nc3 Bb4 4.e3 0‑0 5.Bd3 d5 6.cxd5 exd5 7.Nge2 Bd6 7...Re8 is the routine move but the text is quite trendy. If White chases the bishop with the knight, it retreats and Black then chases the knight with a pawn - or ‘knock for knock', as car insurers like to say. 8.Bd2 Re8 9.Rc1 Na6 New, I think. 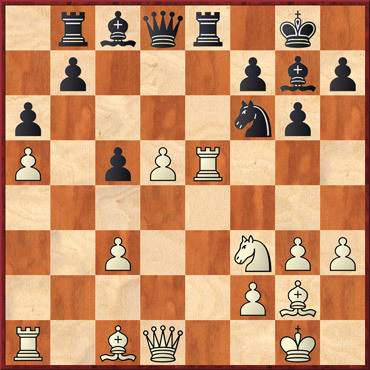 Black supports the c7–c5 push and is not bothered about getting doubled a-pawns since White's resultant light squares will be weakened if the bishop disappears. 10.a3 c5 11.Nb5 Bf8 12.dxc5 Nxc5 13.Bb4 b6! After 13...Nxd3+ 14.Qxd3 Bxb4+ 15.axb4, White has a slight edge based on good control of the dark squares, but the text keeps things more edgy. 14.Ned4? White gets into trouble after this. Instead 14.0‑0 leaves him slightly worse but perhaps not seriously so. 14...a6 15.Nc3 a5 16.Bxc5 bxc5 17.Nde2 He has to go back here otherwise ...d5–d4 is even more unpleasant. 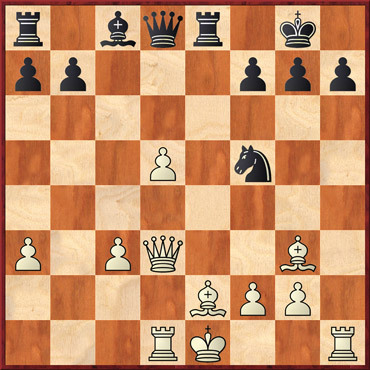 17...Bb7 18.0‑0 Rc8 Black now has a reasonable advantage with his two bishops, secure centre and active piece play. 19.Bf5 Rc6 20.Qa4 Rb6! 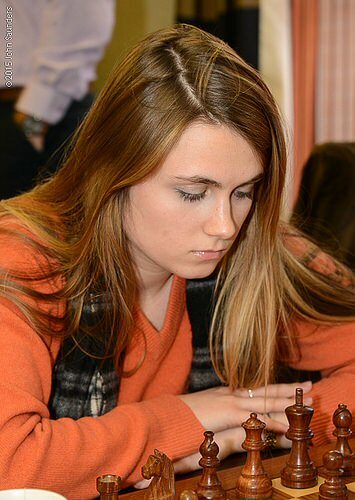 On other boards, the lesser lights seemed to be doing well, particularly Sabrina Chevannes, who at one stage looked to be in with a very good chance of downing former women's world champion Antoaneta Stefanova. 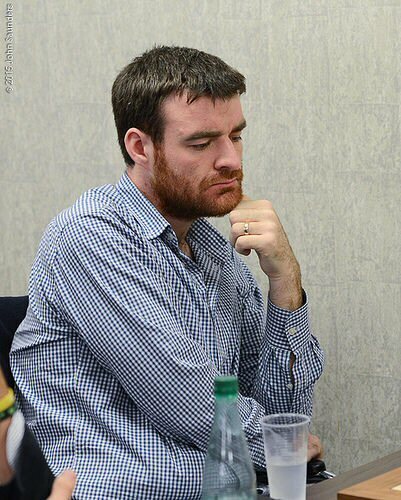 But eventually the dead hand of the rating list came to bear on all boards, except on board five where Adam Bukojemski had the better of a draw, having forced GM Maxime Lagarde to give up the exchange so as not to be mated. Might be worth playing through that game if there isn't enough chess for you here already. Cheddleton warmed up for their big match with the favourites on the Sunday by dispatching Barbican 2. Four white wins and four black draws made it look like a well-ordered plan but it was hardly that. John Pitcher scored a consolation point for the underdogs, beating IM Lorin D'Costa. Jonathan Rogers and Keith Arkell had an eventful game featuring some spectacular oversights. I am very grateful to Keith Arkell for explaining how he came to miss a crunching winner in this game, and for being typically affable in discussing it with me and other players on Facebook (not for nothing is he the current English Player of the Year). I've built Keith's comments into my annotation. It's a fascinating deconstruction of what goes on in a GM's mind when planning several moves ahead in a complicated position, and also a cautionary tale highlighting the importance of re-evaluating a position which you had previously envisaged in your mind when it eventually appears on the board. Oxford and Grantham Sharks are the main rivals for third spot in the pool behind Guildford 1 and Cheddleton, so Oxford did themselves a big favour by winning this match. They needed a slice or two of luck along the way, although it wasn't apparent in this game. With all White's pieces now poised to strike, Black can't afford an inaccuracy. 19...Qc5? 19...Bf6! was the last chance: 20.Qc4 Rxe1+ 21.Rxe1 Nd8 clings on, though 22.Qf4 Bg7 23.Ne5 Bxh6 24.Qxh6 Qd6 25.c4 is still very promising for White. 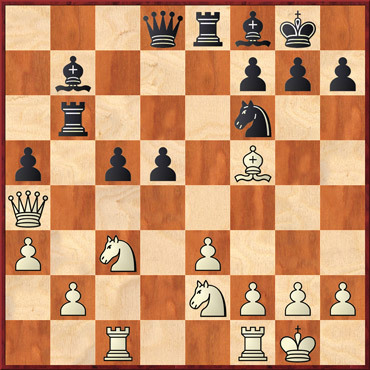 20.Rad1 Rad8 20...Bf5 21.c4 gives White the choice of Ne5 and Qb2 as winning moves on the next turn. 20...Bd6!? 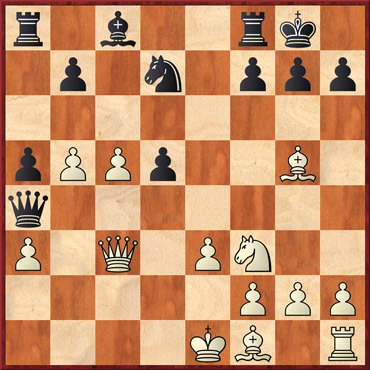 at least forces White to find some precise moves: 21.Be3! Qxc3 22.Bb3 Qf6 23.Qc4! Re7 (Otherwise Rxd6 wins) 24.Qd5! and something has to give. 21.Bxf7+! Kxf7 22.Rxd7! 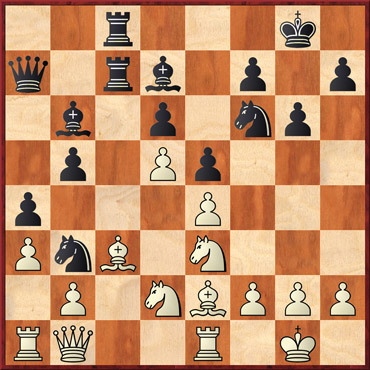 1‑0 Capturing the rook allows mate in one, while 22...Rf8 23.Qe6+ Ke8 24.Red1 is the simplest way to win. 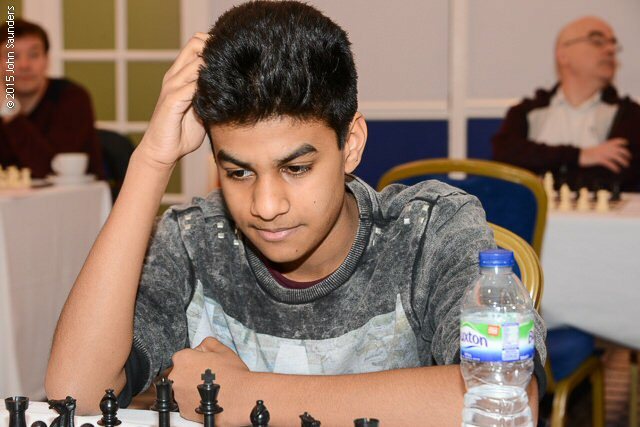 The 17-year-old Portuguese FM David Pires Tavares Martins gave his team a big morale booster with this win against Ameet Ghasi, who must have been ruing his makeshift opening play. Hackney, if you recall, arrived very late for their match with e2e4.org.uk but they were graciously allowed to share the residual time with their opponents and the result was an honourable 4-4 draw. 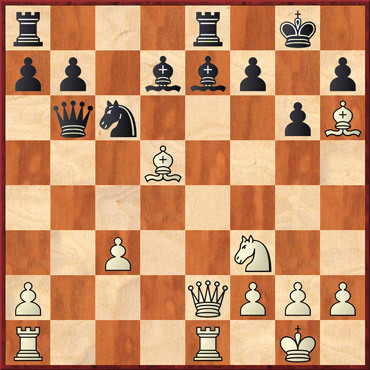 There were the usual swings and roundabouts, with e2e4's Jack Rudd's overlooking a pawn en prise while the same team's Alan Byron getting let off with a draw in what looks like a horribly lost position. 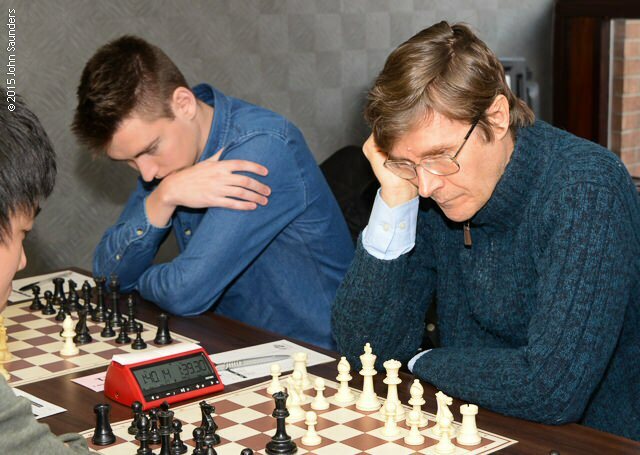 Maybe the weekend came too soon after a gruelling Gibraltar tournament for both of them. 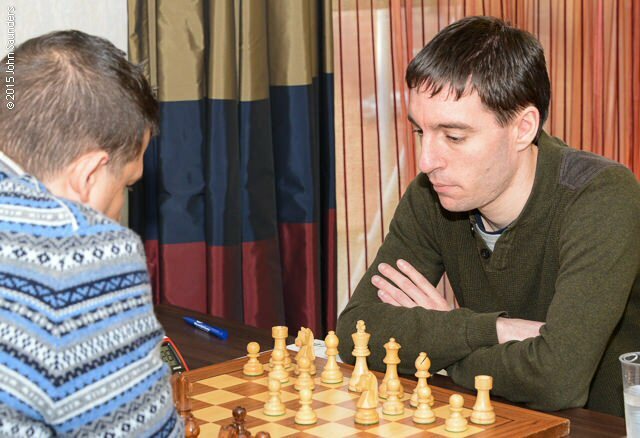 Then again, maybe not: Martin Burrows was in Gibraltar too but he managed to save his team a match point with the following well-played finish to a tricky endgame. Division 1a was all but decided on the Saturday, at least as regards which teams were destined for which final pool. Wood Green could still technically displace White Rose but only if they beat them on the Sunday (feasible) and then see them fail to win their final match next month against Warwickshire (with all due respect to the latter, much less feasible). White Rose did their best to help the Wood Green cause with a couple of Sunday horror shows but it wasn't enough. Don't miss the final couple of moves in the following game – the finish is a collector's piece. 1.e4 c5 2.Nf3 e6 3.Nc3 Nc6 4.d4 cxd4 5.Nxd4 Nf6 6.Be2 d6 7.Be3 Be7 8.0‑0 Bd7 9.f4 Nxd4 10.Qxd4 Bc6 11.b4 A move apparently first played by James Tarjan in 1980. Curiously, the aforementioned player has also made a reappearance recently after some decades' absence from the game. 11...b6 12.Bf3 0‑0 13.Rad1 Rc8 14.Bf2 Qc7 15.a3 Rfd8 16.Qe3 Bb7 Perhaps White was now regretting his overly bold 11th move as it has noticeably weakened the c-file. 17.Nb5 Qxc2 18.e5 Life gets difficult after this. 18.Nxa7 Rc3 19.Rc1!? Rxe3 20.Rxc2 Rxa3 21.Nb5 Raa8 22.e5 is suggested by Houdini. 18...Nd5 19.Bxd5 Bxd5 20.exd6 Bf8 21.Nxa7 It was a tough choice between this and 21.Rc1 Qg6 22.Qg3 Rxc1 23.Rxc1 Qe4, which looks pretty good for Black. 21...Rc3 22.Qxb6 The alternative was to grovel with 22.Qe1 Rxa3 23.Nb5 Ra2 when 24.Nc3 may be answered by 24...Bb7! since 25.Nxa2?? 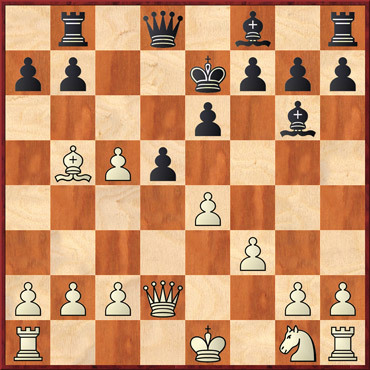 allows mate with 25...Qc6, etc. 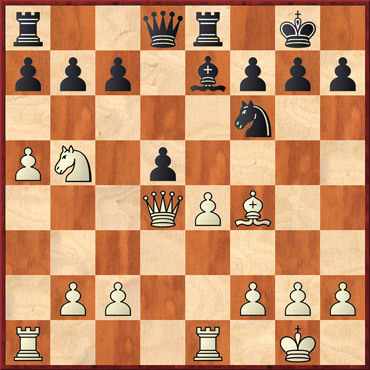 22...Rxd6 23.Qb8 Rd3 Houdini suggests 23...Qe4, forcing 24.Rxd5 Rxd5. Though this does not appear wholly convincing to the human eye, the computer thinks it's game, set and match. 24.Rc1? This meets with a scintillating refutation. The alternative was 24.Rxd3! Qxd3 25.Re1 (To cover Qe4) 25...Qg6 26.Bg3! when Black still has work to do, e.g. 26...Rd7 27.Qb6 h5 28.f5! Qxf5 29.Qf2 Qg6 30.Nb5, etc. 24...Rg3!! Lawrence Cooper, with an eye to the g3 square, the location of a famous Frank Marshall sacrifice back in 1912, asked if the board was showered with gold coins after this move. 25.hxg3 25.Rxc2 Rxg2+ 26.Kh1 Rg3 mate. 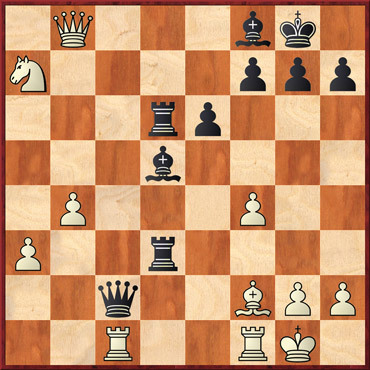 25...Qe4 0‑1 White has a choice between being mated in one move, or in 13 moves after 26.Qxf8+ - I'll leave readers to amuse themselves working out how White can keep the game going that long. The advantage in this game had already gone back and forth a couple of times - and is going to do so twice more. 38.Bf3? 38.Kh2!? Bxf2 39.Rf1 remains balanced, so the engine tells me. White has the threat of 40.Ne4 forking quuen and bishop but it's decidedly complex after 39...Rc2!? 38...Rc2! Now Black is in dire trouble. 39.Rf1 Ra2 40.Kg2 Qf5! Not 40...Rxa4?? when 41.Bd5! turns the tables. 41.Qc6 Bc5 42.Qa8+ Kg7 43.Qb7 Bxf3+ Black could have played 43...Rxa4! 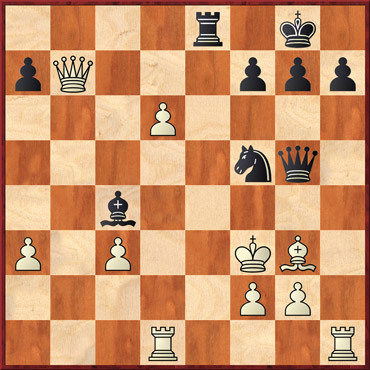 this time if he had spotted that, after 44.Bd5 comes 44...Be2! and Black gets his retaliation in first. But the text is pretty good too. 44.Qxf3 Qxf3+ 45.Kxf3 Ra3+? 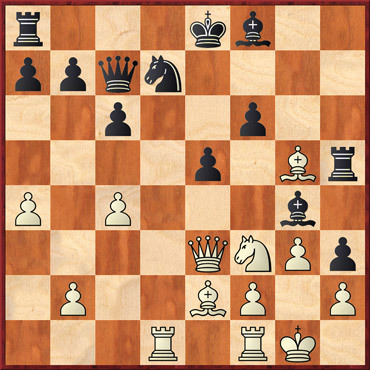 Best not to chase the white king up the board, where it finds a new purpose, and rather play 45...Rxa4 immediately. 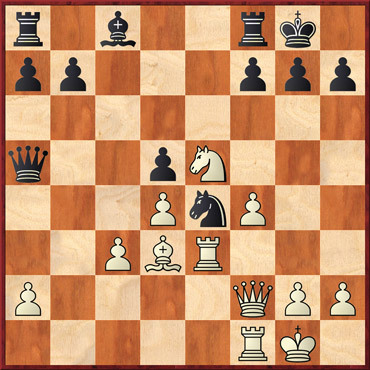 46.Ke4 Rxa4+ 47.Kd5 Rd4+ 48.Kc6 Rd6+ 49.Kc7 Rd2?? Disastrous, turning a likely win into a loss: instead 49...Rd3 and Black can then let the a-pawn off the leash, with a probable win. 50.Ne4 Rb2 50...Rc2 51.Nxc5 Rxc5+ 52.Kxb6 is worse. 51.Nxc5 Rxb5 52.Na4 1‑0 Black could play on but his long-term chances of survival are minimal. Guildford 2 vaulted over Barbican 1 with their 5-3 win. 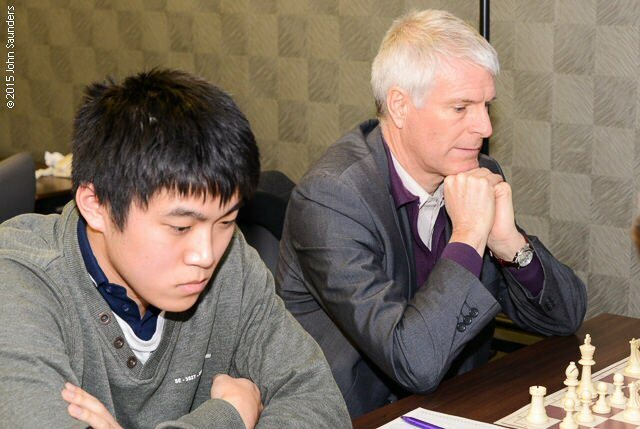 Yang-Fan Zhou's game against Matthew Turner revolved round one long, forcing sequence which seemed to span the passage from opening to endgame. The ADs suffered a narrow defeat to Blackthorne Russia. Given that the two teams were headed into different final pools anyway, it was a dead rubber. It consisted of seven draws plus a win for Rita Atkins on bottom board against Jana Bellin. Warwickshire Select lost again, by virtue of a default on bottom board and a loss by Geoff Lawton on top board, to James Cobb, in a position where he was losing the exchange but not demonstrably lost (at least, I didn't think so - if you're interested, look it up). The result will of course matter when it comes to the relegation issue, where it doesn't need Private Fraser to predict that the Midlands side are probably ‘doomed, I tell ye', whilst my former Welsh colleagues will be glad of the two match points, and having scored all four of their match points so far against fellow strugglers (which means they will be carried forward and count towards their final pool tally). Now we come to probably the key match of the season so far: Guildford 1 versus Cheddleton. At the start of play the two teams were still on 100% match points, although Guildford were way ahead on game points. 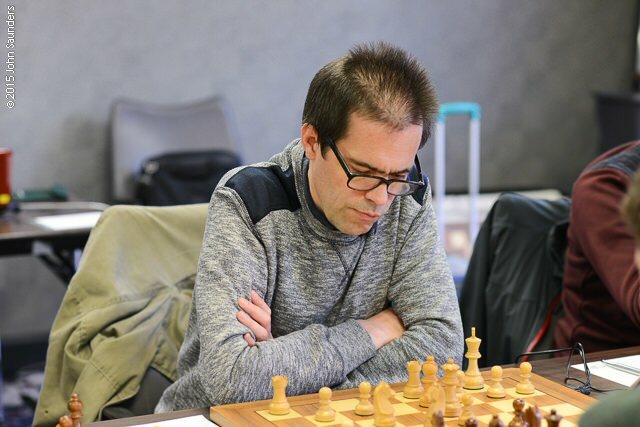 But it turned out to be a very close match and could have gone either way in several games, in particular the only decisive game, where for a fleeting moment Mark Hebden was at the mercy of Fiona Steil-Antoni. 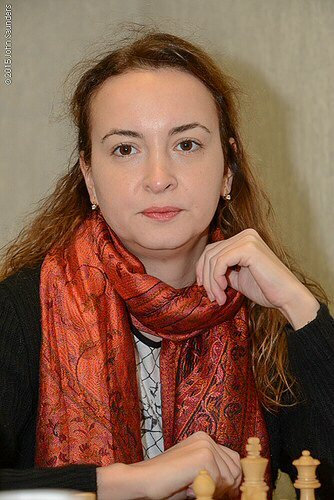 Antoaneta Stefanova's position looked shaky as she lost a pawn coming up to the control, but her opponent allowed her to win it back a few moves later. Another Guildford player, Maxime Lagarde, didn't look too comfortable against Simon Williams, but it simplified down to a drawn endgame. 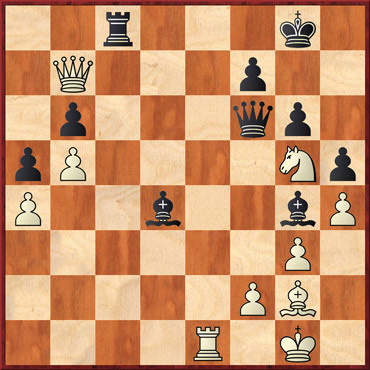 David Eggleston against Jean-Pierre Le Roux was a highly eventful draw, suddenly exploding into tactical fireworks around move 19 but fizzling out to a perpetual check only a handful of moves later. Matthew Sadler and Gawain Jones both pressed for a win for a while longer than others but by then the match points were in the bag and there was little incentive to go on. After winning this match, Guildford 1 may feel they have at least one hand on the championship trophy. Perhaps only their own second team can now give them a fright in the matches that remain. Grantham Sharks aren't yet mathematically sure of a place in the Championship pool but they dipped a toe in it by beating e2e4.org.uk. 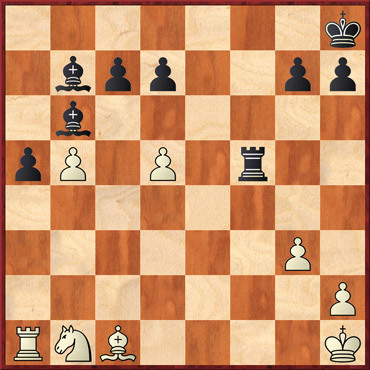 The following game featured a tricky opposite-bishop endgame. Barbican 2 drew their match with Cambridge University. For Barbican 2 that result means life in the relegation pool, while for the Cantab team it means they will have to overcome Grantham Sharks in their final preliminary match if they are to swim with the even more dangerous predators of the Championship pool come round eight. Meanwhile Oxford edged Hackney by a single point. Oxford have been the dark (blue) horses of this year's 4NCL and deserve their place in the Championship pool. Hackney are condemned to the relegation pool. Did they miss any chances in this match? Well, Michael Tasker did aim Alekhine's gun at Ben Savage at one point (you know that motif where a player lines up two rooks along a file with a queen behind them) but he turned out not to have any ammo. Meanwhile Bob Eames had a torrid time against Justin Tan.